This is a travel post about hair. 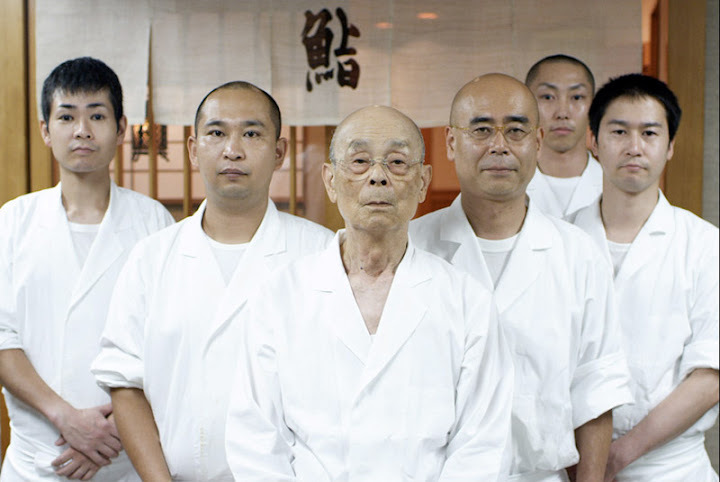 If you don’t care about hair, I’d suggest drooling over pictures of Jiro’s sushi or cooking up a simple frittata. Back to food soon enough, but I just had to share a little more about my visit to Japan! This is a picture of me in a crowded Tokyo toy store surrounded by Furbys a day before getting my hair done, standing next to someone who is clearly not Japanese. As the owner of a head of Asian hair, one of the things I looked most forward to on my trip to Japan was getting my hair done. Tokyo is full of beautiful people with amazing hair and incredible wardrobes, so I’ve spent the first couple of days here forgetting that most Asians have naturally black hair and starting to think I need to add false eyelashes with feathers on them to my daily routine. I also now think it barbaric to have to sit on unheated toilet seats that don’t include noisemakers, air fresheners or adjustable bidet jets. The last time I got my hair cut with a new stylist at a trendy beachside salon back home, I asked the stylist what she would do if there was anything she could do to my hair. She said, “The Rachel. Your hair is perfect for that.” which, 1) I know to be untrue, 2) the Rachel should not be suggested in 2012 and 3) should have sent me running immediately. But I was feeling adventurous and said, “Not the Rachel, but do what you think would look best.” What I know now is that if you’re Asian and you say that, you will get a local news anchor haircut, not like Connie Chung circa 1985. I went home, cut some choppy layers into my hair and have been cutting my own hair ever since. Sandra made me an appointment with Hiroshi Noda, or “Noda-san” at Insolite Salon in Hiroo. I decided to try color, since I had just cut my own hair two days before and figured that since I don’t speak Japanese, it would be easier not to have to try to mime “texturize” and “more volume here.” I’m not sure why I thought acting out color would be easier though. Sandra, or San-do-ra, on the left, made my reservations for Insolite and Jiro’s sushi place. I am standing like a superhero. The Salon is beautiful and everyone who works there has amazing hair. I felt an unfamiliar feeling…of hope. Noda-san pulled out pieces of my hair. He asked about the last time I had a cut – a year ago? Clearly my hair indicated that I had spent the past year in a cave. I giggled maniacally and confessed that I had just cut my hair two days ago. I think they were laughing at my hair. I agreed to a cut. The appropriately unflattering “before” picture. Noda-san is on the left, laughing at me. Noda-san’s hair is cool in real life but looks shocked in this picture. I was given an arm rest that goes around your torso and across your lap, which I can only describe as a luxurious version of a Boppy pillow, and which was wonderful. I may start to bring one with me for any situation that requires me to be in a chair…because why should my arms be allowed to fall ever. Noda-san wore a holster, which held more scissors than a preschool classroom. He fluffed my hair out and pointed to the longer straggly ends and said, “Jellyfish.” I was impressed with the vocabulary he possessed for mockery. He was quick, precise and, I was glad to see, employed a different technique from my own. 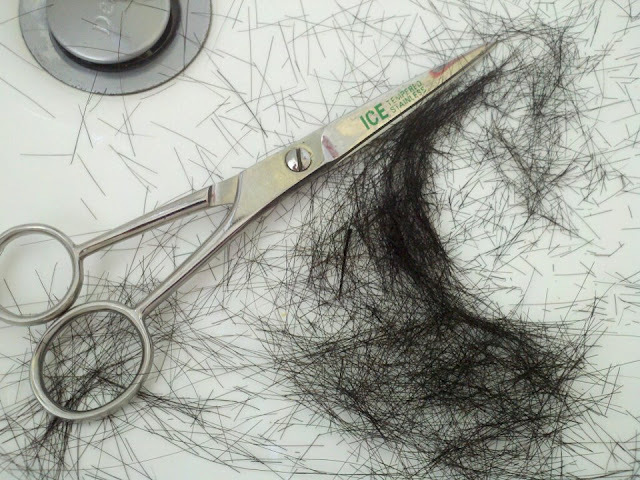 His scissors were so sharp that I rarely saw him bring the blades together – the hair just fell on contact with a blade. I wanted to say, “Can you rough it up a little? I want the layers to be a little more edgy” but instead I nodded and said “Domo arigato.” It was fine. People are always giving me conservative, age-appropriate haircuts (I blame my round face), and I’m always trying to get them to rough it up a little more. But I really liked the way he volumized the top of my hair, and his technique was very good. Plus, knowing an addict when he saw one, he gave me tips for the next time I cut my own hair. Next, a crew put little plastic shower caps on my ears. I laughed because I’m immature. I asked Sandra if she had gotten those too and she said no, since she had highlights and I was getting allover color. Which is when I learned that that’s what we had agreed to. Which was fine; it’s only hair. I was brought to a rinsing station and experienced the longest and most wonderful hair washing experience of my life. My face was tented with an aromatherapeutic gauze of my choice, followed by an amazing shampoo experience and a loooooong scalp massage. I was then brought back to my chair and given a second head and shoulder massage. Which is when I decided that I really needed to move to Japan. Noda-san came back and dried and styled my hair. The color is great – it’s subtle enough to grow out without too much trauma, but visible enough that it warmed up my complexion a bit. “After” – me and Noda-san. I know, you can’t tell from the picture that much happened but I got two massages and aromatherapy out of it! In writing this post I discovered that Noda-san has a blog! Which features a bunch of models and shows and conspicuously (and wisely) excludes me and my shower-cap-covered ears from it. So if you’re in Tokyo and looking for a pampering hair experience, I’d recommend Insolite. If you’re looking for the exact haircut you want, I’d recommend going to Insolite and speaking Japanese. My trip to Tokyo would be best described as Sandi Dreams of Jiro Dreaming of Sushi. As the 2nd most difficult restaurant in the world to get into, going to Sukiyabashi Jiro may be the biggest accomplishment of my life. And I had to have a lot of help to get there. We started thinking about a trip to Tokyo in July. My husband used to live there and my friend Sandra is living there now as an expat (whenever anyone tells me that they’re an expat all I hear is “living like a Kardashian”). For someone who loves food, fashion and bathrooms as much as I do, Tokyo is pretty much Mecca. With three Michelin stars, an acclaimed documentary on the chef, and limited space, it’s no mystery that it’s tough to get in. What makes it nearly impossible to pull off, though, is that no one on staff speaks English, and that they tend to not welcome foreigners without a Japanese host. “If they detect an accent, it’s likely that they’ll tell you nothing is available,” says A Life Worth Eating’s Adam Goldberg, who had trouble getting in for quite some time but has since managed to dine there on multiple occasions. For this we elicited help from Sandra’s friend Meg, whom I’ve never met but who, as far as I’m concerned, must be a mythical creature with superhuman powers to have gotten us a reservation. Attempt #1 was in September, where Meg was told that she could not make a November reservation until October 1. Meg, a native Japanese speaker, made the reservation for us, under San-do-ra. San-do-ra was to bring a deposit of 20,000 yen at least a week before our reservation. On November 14th, San-do-ra (not a native Japanese speaker) styled her hair like mine and did a reconnaissance trip, appearing at Jiro’s to bring the deposit. San-do-ra’s Japanese had clearly degraded between the time she made the reservation and the time she brought the deposit, but she had cash so it was okay. Even though she had her son with her as well as Flat Stanley. On the morning of Monday, November 19th, we practiced asking if it was okay to take pictures, and then did photo drills (since the sushi should be eaten immediately after it’s made) where we pretended that a bunch of cheese was the sushi and I had to take photos and eat in rapid succession. I was also instructed to say, “Konichiwa, San-do-ra des” (“Hello, I am Sandra”) after which, as a non-Japanese speaker, I would be able to say nothing else and it would be clear to the staff that San-do-ra had a serious language-debilitating condition. We arrived early to the Ginza district and we did a practice run to the restaurant, followed by some brief shopping and a return about 10 minutes in advance of our reservation. We approached the door tentatively and were waved in by one of the apprentices, and after announcing my “San-do-ra des”, we were the first ones seated of the 10 seats in the restaurant. Behind the counter were Jiro, his son Yoshikazu and an apprentice. I’d heard that Chef Ono is stern and the atmosphere is intimidating, but I didn’t get that feeling at all. It felt respectful, and focused. I didn’t mind the quiet so much. I hid my camera (actually, San-do-ra’s camera) under the counter until my husband asked in Japanese if it was okay to take photos. They said that it was fine — sushi photos only — and actually provided a little orange mat for my camera to live on. I noticed as the meal progressed that others were taking photos too so I felt slightly less weenie-ish about it. Yoshikazu cut the fish and Chef Ono assembled and shaped the sushi, brushing it lightly with soy sauce just before serving. First up was the sole. It was presented, as were all the other pieces, with a side of ginger, which I never used. The first thing I noticed was the delicious vinegared rice, which had a firm and decisively lively texture where you could feel each of the individual grains. The wasabi was, as was the case in each of the pieces, assembled into the sushi itself. Delicious. I wasn’t a very experienced squid sushi eater, so have limited basis on which to compare this one. What surprised me about the squid was that the initial contact was crunchy – followed on by a chewy, cushiony texture. And then the tuna. The lean tuna was the most beautiful piece of sushi I had ever seen. It had a breathtaking hue and it glistened as it awaited consumption. It didn’t disappoint – it was unexpectedly tender and a smooth, warm flavor, and it’s amazing that anything with low fat content could taste like that. The semi-fatty tuna was soft and smooth as well. The fatty tuna was like butter. That’s a very good thing. After this one Jiro gave us lean tuna again — at which point his son and the rest of the staff starting yelling, “ah ah ah ah!! !” — he had given us another guest’s tuna! He laughed and apologized and gave the tuna to the rightful eaters, we all had a little laugh amongst ourselves. The mood was a bit more relaxed after that. In the film, Jiro says that he makes smaller portions for women, since sushi is meant to be eaten in a single bite. I didn’t observe this to be the case with me, but perhaps they perceived me to be large-mouthed. In any case, when I saw this one, I was little worried about how I was going to consume it in a single bite. I was right. As soon as I put it in my mouth, I realized that there was no room for the manipulation involved in chewing. So I started to breathe deeply in the completely silent restaurant, telling myself do not gag, do not gag, whatever you do do not gag…and eventually my saliva must have broken it down a bit because I was able to chew. All this to say that I have little memory of how this particular one tasted since I was mostly focused on not being horribly offensive. I do recall that it was firm and that the sauce complemented it nicely. “Oh!” I said (very articulate) and laughed and snapped a picture. To my relief he took the prawn back after the photo and cut it into manageable halves. It was lovely, soft and lobster-like. The bonito to me was the star of the show. It had an unbelievably delicate texture, with smoky and scallion notes, balanced by a sauce that just made it all incredible. More bonito! I wanted to shout. More more more! But I just ate it and nodded as much like a Japanese person as I could. The squilla, or mantis shrimp, surprised me. It was gritty and dry in texture — not at all what I expected. Hard for me to judge the quality of this one since it was my first time consuming squilla, but it was not my favorite. The uni, or sea urchin, however, was divine. It completely melted in my mouth…like ice cream. The baby scallops looked delicious. And they were. Again, this one was quite big: as you can see it’s taller than the other pieces, wrapped in some seaweed and topped with the scallops. I decided this was going to be a two-biter. By the time the sea eel came around I was pretty much drunk on food and started taking blurry pictures. It had a nice light sweetness to it from the sauce. Just kidding. That’s Jiro with Katy Perry. I don’t think he’d ever let me get that close. We went to pay and chatted with Yoshikazu about the release of the movie (they had posters and flyers by the door). Apparently Japan is the last place the film is being released. He was friendly and we had enough Japanese and English between all of us to have a pleasant exchange. Then we exited and disappeared into the Ginza night. Thank you to San-do-ra and Meg without whom this would never have happened!